Home » Website Building » WordPress » How to Disable New User Registration in WordPress? How to Disable New User Registration in WordPress? WordPress powers around 30% of the websites on the web. This popularity not only attracts many other users but also hackers and spammers. Protecting your WordPress site from spammers is one of the hectic jobs for every WordPress site owner. After creating a new site with WordPress, the foremost annoying thing is receiving plenty of notification emails for new user registration on your site. You may be confused from where these mails are originating, especially if you are using subscription forms for newsletter or user registration. Also, you will continue to get these suspicious and junk emails even after disabling all subscription plugins on your site. Here is a simple solution, if you are looking for the way to stop these new user registration emails from your WordPress site. How Does Someone Register On My Site? Before we start, it is necessary to understand that WordPress by default enables membership registration on your site. 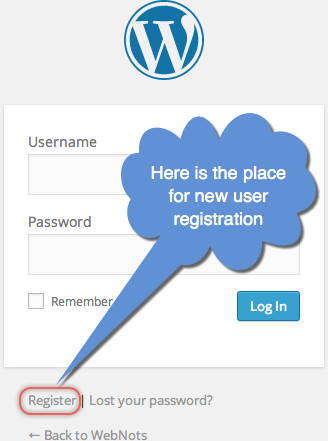 You can see this in the login screen when you try to login to your WordPress dashboard. When you login to your through “www.yoursite.com/wp-admin/” or “www.yoursite.com/wp-login.php” you can see the “Register” link below the login box. Notify administrator (that’s you) through an email. Send a login password to the registered user. The issue here is that you as an administrator need not confirm new user registration and WordPress does this automatically for you. However, this leads to lot of junk registration or even you are not aware of the membership option enabled on your site by default. Where to See New Users? When you logged as an administrator to your WordPress site, you can see all new registered users under “Users > All Users” section. Below is how it will look like and the emails shown are the junk registrations on one of our testing site. How to Stop These Annoying Emails? Login to your WordPress dashboard as an administrator and navigate to “Settings > General” as shown in the below picture. You need to consider three important settings for new user registration. E-mail Address – this is your admin email where you will get all notification emails from WordPress including new user registration. Membership – By default the check box “Anyone can register” is selected for receiving new user notification emails. New User Default Role – By default WordPress set this as “Subscriber” and hence all registered users will be given to the subscriber role. There will not be any issue till the time the new user’s default role is set as a subscriber. The person who registers can only receive subscription emails from you at the maximum. Assume you have wrongly selected new user’s default role as “Administrator”. This will lead to disaster as the person who register will have all access exactly like you to publish or modify or delete content on your site. In order to stop receiving new user register emails, you need to completely disable the membership option on your site. Simply disable “Anyone can register” check box showing against “Membership” option to stop someone anonymously register on your site. What Happens When You Disable Membership? 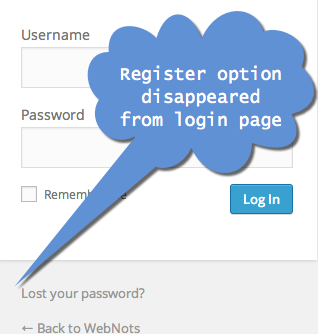 When you disable this check box, WordPress will remove the “Register” link on the login screen. Hence, no new user can register on your site without your knowledge. You can still create user accounts, assign role and communicate to users from the dashboard as an administrator. Sometimes, you want to have membership option on your site without getting lots of spam registration emails. In this case, we recommend using appropriate plugin for login/registration. The plugin will enable you to first confirm the new user registration instead of WordPress confirms without your intervention. When you have WooCommerce plugin installed, it will change the default registration and login pages for users. In this case, you don’t need to worry and disable the default membership on your site. If you are not worrying about anonymous registration but don’t want to receive email notifications then try “Disable New User Notification Email” plugin to achieve this. When you have lots of junk users on your site, go to “Users > All Users” section. Select all existing junk users and choose “Delete” from the “Bulk Action” dropdown box. Click “Apply” to delete all selected users in single click. 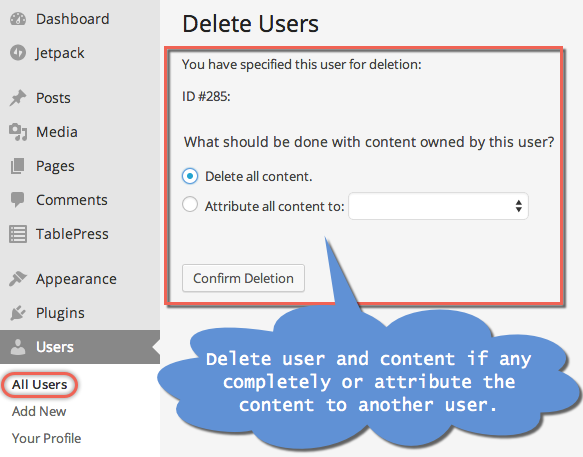 WordPress will ask you to confirm the content deletion which you can confirm to proceed further as junk users should not have any posts published under their username. Protecting your WordPress site starts with your own awareness. In order to disable new user notifications, disable membership registration on your site if not that is not required for you. It is also important to setup correct subscriber role when you want to enable registration function on your site. We strongly recommend use suitable plugin for membership purposes instead of using the default WordPress option.